Ananka's Diary: What Goes Well With Giant Squid? How about a 44lb (20kg) mushroom? This one was found in southern Mexico, not far from the Guatemalan border. And to stay on topic- I did note a reference in it to giant squids. Thanks! What can I say . . . squid are my passion! That is a lot of mushroom. I would never... ever... eat ANYTHING bigger than my head! Much less half my body. 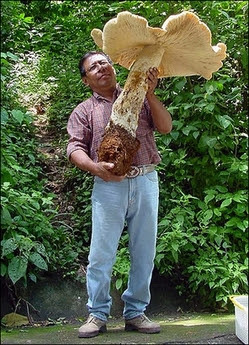 I like mushrooms but that is just too much!